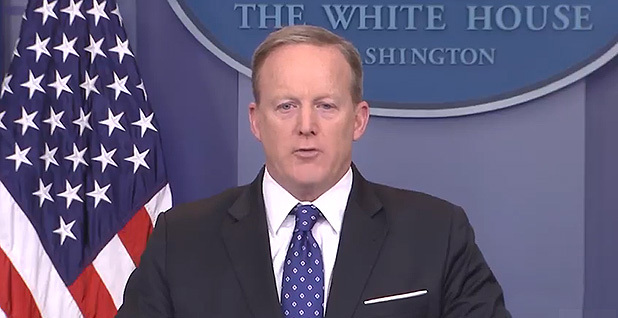 White House press secretary Sean Spicer says a decision on the Paris Agreement will come after the Group of Seven meeting. Photo courtesy of C-SPAN. Supporters of the Paris climate deal welcomed yesterday's news that President Trump wouldn't decide whether the United States will withdraw from it until after this month's Group of Seven summit, hoping the extra time and exposure to foreign leaders will work in their favor. White House press secretary Sean Spicer said at a media briefing yesterday that Trump will announce his choice after the G-7 meeting instead of before it because he "wants to make sure that he has an opportunity to meet with his team, to create the best strategy for this country going forward." A meeting between Trump and key White House staff set for yesterday was postponed indefinitely. But even before Spicer's news, Paris Agreement backers in Washington, D.C., and Bonn, Germany — where U.N. climate talks are underway — were expressing hope that Trump wouldn't rush it. "This is a crucial issue and one that deserves careful consideration," Thoriq Ibrahim, a minister from the Maldives who leads the Alliance of Small Island States negotiating bloc to the U.N. Framework Convention on Climate Change, said in a statement yesterday morning. "If more time is needed to make an informed decision, we absolutely support that." The White House had previously set itself the deadline of the May 27 G-7 leaders' summit in Taormina, Sicily, which Trump will attend with heads of state from other powerful developed nations. The G-7's Italian presidency had hoped to reaffirm the Paris Agreement, as the group did last year. The White House's move means its final communiqué is unlikely to mention Paris directly because that would require a consensus by all seven members. But where that might have disappointed Paris proponents weeks ago, when White House Paris backers appeared to have the upper hand in an internal tug of war, it now seems the best option. News reports last week held that Trump was on the brink of making good on his campaign pledge to "cancel" U.S. Paris membership, spurred on by U.S. EPA Administrator Scott Pruitt's and chief strategist Steve Bannon's arguments that it would let foreign bureaucrats dictate U.S. policy. "Since the difficult Cabinet-level meeting on April 27th, every day that we don't get an announcement that the U.S. is pulling out of Paris is somewhat of a relief," said Andrew Light, a distinguished senior fellow at the World Resources Institute. The president's daughter and adviser Ivanka Trump has taken a personal role in steering internal discussions. She joined with other administration proponents of Paris, including Secretary of State Rex Tillerson, sources say, to persuade the president not to meet his self-imposed G-7 deadline. Tillerson's likely No. 2 at the State Department appears to share his would-be boss's view on Paris. John Sullivan, the nominee for deputy secretary of State, told a Senate committee during his confirmation hearing yesterday that "as a general matter ... the United States is best served and its interests protected when it has a seat at the table" (see related story). But he referenced "complex issues, including legal issues with respect to Article 4.11," that might factor into Trump's ultimate decision. Delegates gathered in Bonn were cautiously optimistic that the move would give pro-Paris factions in the administration a chance to counter legal arguments for leaving Paris. Those — pushed by Pruitt and Bannon — hinge on an interpretation of Article 4.11 of the Paris Agreement and another passage that environmental lawyers have called inaccurate. It also means Trump heads to Italy without having committed himself on the climate deal. He will be surrounded by world leaders who have committed their nations to reducing greenhouse gas emissions and to the business opportunities those actions could provide. And Trump has shown in the past that he can be persuaded by other heads of state, as when the prime minister of Canada and president of Mexico drew him back to the negotiating table on the North American Free Trade Agreement and when Chinese President Xi Jinping convinced him that China was not, in fact, a currency manipulator. Light noted that other developed countries will now have a chance to highlight the consequences of a Paris departure, including for Trump's ability to achieve the rest of his foreign policy agenda. "But if this message is not made crystal-clear to President Trump at the G-7, it will be one of the biggest missed opportunities in the continuing struggle of how the world is trying to move forward on this issue," said Light. Other countries and U.S. proponents of multilateral engagement stepped up their outreach to Trump over Paris in recent days, as a withdrawal appeared to be overwhelmingly likely. Climate Home reported that Chai Qimin, director of international cooperation at the Chinese government's National Center for Climate Change Strategy and International Cooperation, warned from the Bonn summit that a Paris retreat could affect Trump's clout at the G-7 and larger Group of 20 meetings. Meanwhile, former Secretary of State George Shultz, who served under President Reagan, argued that the decision will "echo across his presidency" in an op-ed published yesterday by The New York Times. Shultz and his co-author, Ted Halstead, president of the Climate Leadership Council, said leaving the Paris accord would close foreign markets to American businesses. Also this week, more than 200 institutional investors with $15 trillion in assets urged Trump and other world leaders to stand by their promises outlined by the Paris Agreement. They said climate change poses financial risks for their firms. Separately, a group of large businesses pressed Trump to stay in the agreement in full-page ads this week in The New York Times, The Wall Street Journal and the New York Post. They include Apple Inc., Google, National Grid PLC and Tiffany & Co.
"By expanding markets for innovative clean technologies, the agreement generates jobs and economic growth," the ads say. "U.S. companies are well positioned to lead in these markets. Withdrawing from the agreement will limit our access to them and could expose us to retaliatory measures." Alden Meyer, director of strategy and policy at the Union of Concerned Scientists, said, "International and business pressure to stay in Paris seems to be having an effect, at least in terms of taking more time to weigh the decision. "It's obviously not a guarantee of anything, but it's better than a hasty, ill-thought-out decision," he said. Lisa Jacobson, president of the Business Council for Sustainable Energy, claimed some credit for the delay for the business interests that have urged Trump to reconsider. "The fact that it's still being considered is [based on] the strong call from many sectors in the business community that this is in the U.S. commercial interest," she said. But Climate Hawks Vote's R.L. Miller paraphrased the most indecisive character in Shakespeare's canon to note that remaining in Paris would mean a less ambitious U.S. commitment. "What does he want, points for playing Hamlet on the world's stage?" she asked in a statement. "To destroy the treaty or hollow it out from the inside, that is the question."